A few week's-end items I've had my eyes on. BAVC'S "THE STREAM": First, the most excellent Bay Area Video Coalition (BAVC) has a series of short videos called "The Stream," each of which profiles folks who have used "story-driven technology to inspire social movements." Examples include documentary films and Second Life projects on Gulf Coast rebuilding, Middle East peace, and more. You can also listen to audio versions of these profiles with a free PRX account. L.A. GANG TOURS: Here's the promotional video for "L.A. Gang Tours," a Los Angeles bus tour of sites related to street gangs, such as the LA County Jail and the Pico Union Graffiti Lab. As this video segment from the local NBC affiliate says, the tour operators use the tours as a way to increase the peace, but some say it's exploitative. A similar debate erupted around the bus tours of New Orleans after Hurricane Katrina. I can see their point, only the difference here is that the LA bus tour is run by former gang members, and profits are used for job and community development. Whereas the New Orleans tours were run by a tour bus company, and I believe it was only under pressure that any of the proceeds were donated to local nonprofits. BROADCASTR APP: I'm looking forward to trying out a new website and phone app called "Broadcastr" that launches next month. Essentially, Broadcastr aims to do with the human voice what YouTube does for video, or Flickr does for photos. As reported in this New York Times story, "Users can upload audio and 'pin' it to a geographical location. When you visit a location either physically or with your web browser, you will be able to listen to stories pinned to that spot." In partnership with the National September 11 Memorial and Museum, Broadcastr is uploading thousands of audio clips related to 9/11, so users will be able to hear stories from witnesses, firefighters, and others while visiting the World Trade Center site or other related spots in Lower Manhattan. I think it's a fantastic idea, and I'm excited about how anyone will be able to upload audio and create their own tours and other projects. I'm sure media artists will use the app in creative ways. 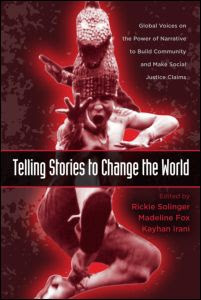 "TELLING STORIES TO CHANGE THE WORLD": I've been reading an anthology called "Telling Stories to Change the World: Global Voices on the Power of Narrative to Build Community and Make Social Justice Claims," edited by Rickie Solinger, Madeline Fox, and Kayhan Irani. One of the chapters is on the Hudson River Playback Theatre's "Immigrant Stories" project. In the "Playback" theater method, people in the audience will tell stories from their lives, and then Playback actors will act out those stories. As Jo Salas writes in her chapter on the project, "An atmosphere of exploration and discovery develops as voices are heard and responded to in spontaneous theater. The actors, like the tellers, step into unscripted and uncharted territory with each story." (p 110) And as the website of the International Playback Theatre Network adds, this form of theater is in "direct service to healing relationship, communication and understanding between people." The book has some really sharp essays I'd like to write about at more length later on.